South Lanarkshire Leisure and Culture co-ordinates the Rugby Union development programme. The programme aims to promote and develop rugby throughout the region. To achieve this aim, the programme is involved in school rugby, club rugby, pathway/development squads as well as coach and referee education. For availability of courses in your area have a look at our ACE brochures. The primary 'Touch Rugby' programme is ongoing, with schools throughout the authority being targeted. Festivals are run as a culmination to all 'Touch Rugby' programmes. The secondary 'Full Contact' programme has started, offering curriculum- based sessions to encourage after school clubs and fixtures. S1/2, S3/4 and U18 festivals are operated throughout the year to encourage participation. School trials take place in S1/2/3. This is the start of the selection process for the Pathway and local development squads (see below). Schools Cup competitions are run for S1/2 and S3/4. Biggar RFC and Hamilton RFC are supported by Club Development Officers (CDOs) with Cambuslang RFC and East Kilbride RFC recruiting Modern Apprentices for season 2011/12. Contact details for CDOs are listed below. Local Development Squad trials are held, with all clubs/schools being asked to forward players at S1/2/3 levels. Finalised squads will then be selected to represent Lanarkshire in fixtures against various other Local Authority areas. SRU Skill Camps will be held each year at U14 and U15 age groups where players will be assessed and given feedback on areas of strength and weakness. Players will then be selected from the U15 group to train as a Glasgow Chiefs squad for the following seasons Pathway at U16 level. 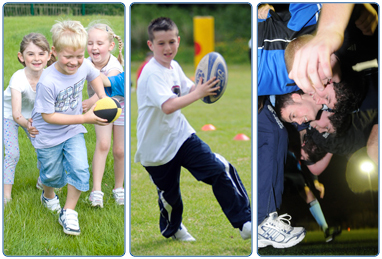 Rugby Ready courses are run, throughout the season, depending on demand. UKCC courses are available and are run at various times throughout the year (usually weekends). Key National Theme (KNTs) updates are offered to all mini/midi sections. Teacher support: Touch Rugby courses are included in the in-service menu. Referee development courses are run locally by Glasgow District's Referee Development Officer, Martyn Hawthorn (tel: 07764430999).